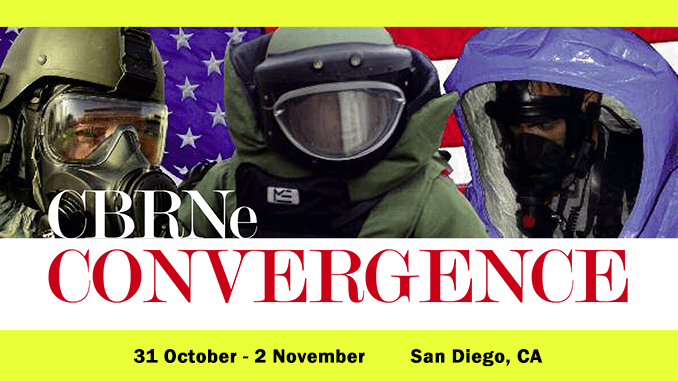 With just one month to go before the start of CBRNe Convergence 2016 in San Diego, there’s still time to register for your place! The 9th Annual CBRNe World Congress and Exhibition takes place on 31 October – 2 November at Town and County Hall, San Diego. And many more…. You will hear from the best civil and military organisations about how their recent response to attacks, exercises and research is improving their CBRN defence capability. With an exhibition of more than 60 CBRN companies, streamed sessions, and poster sessions, the 9th Annual CBRNe World Congress and Exhibition will give you all the networking and learning opportunities you need to keep your organisation at the forefront of CBRN. To register for your delegate place, just go to: www.cbrneworld.com/convergence2016 and fill in your details. Global Biodefense is an official media partner of CBRNe Convergence 2016.